As we all know by now, the rights for Spider-Man is now shared by Sony Pictures and Marvel, but many of the other great Spidey characters are still owned by Sony. Since that's the case, there are still rumors of Spider-Man spin-off movies. A while back, before the disaster of a movie known as Amazing Spider-Man 2, Sony was teasing us with the idea of a Sinister Six movie, a Black Cat movie and a Venom vs. Carnage movie. Well, it would seem that these movies are still a possibility. I'm assuming that Sony is seeing how well everyone's favorite webslinger does in the new Spider-Man: Homecoming film that comes out later this year. It would seem that Sony's plans have changed slightly. Now the spin-off is only going to feature Venom, which seems like a good idea to me. You can't have Carnage without Venom after all, so let's get some backstory on these characters before we have them go head to head on the big screen. Anyway, since I've already talked about the first appearance of Carnage, it's now time to tackle the first appearance of Venom. 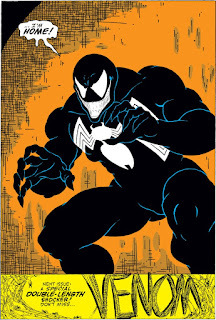 Acutally, if you want to get technical about it, this is the third appearance of Venom. 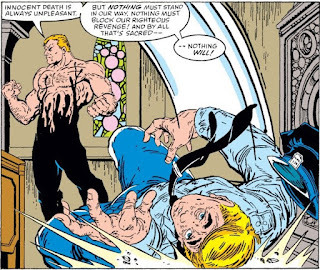 In ASM #298, we see the alien symbiote envelope the hands of who we now know is Eddie Brock. This might be considered a cameo appearance, but I'm not exactly sure since only the hands are shown. Neither CGC or CBCS note any appearance of Venom. He also makes an appearance in three panels of ASM #299. This time, we get to see the full character, not just his hands. 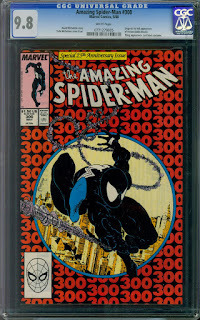 This issue is considered the first cameo appearance of Venom by the big two grading companies, and Overstreet recognizes it as his "1st brief appearance". It isn't until issue #300 that we get our first full story featuring the villainous Venom. We also learn that underneath the symbiote. is disgraced journalist Eddie Brock, and he isn't the "Lethal Protector" that he's become today. He started out as a unforgiving killer, hellbent on revenge. Before Eddie was writing "venomous celebrity exposes", he was a journalist at the Daily Globe, writing an expose on the serial killer Sin Eater. He was getting information from someone claiming to be the Sin Eater himself. 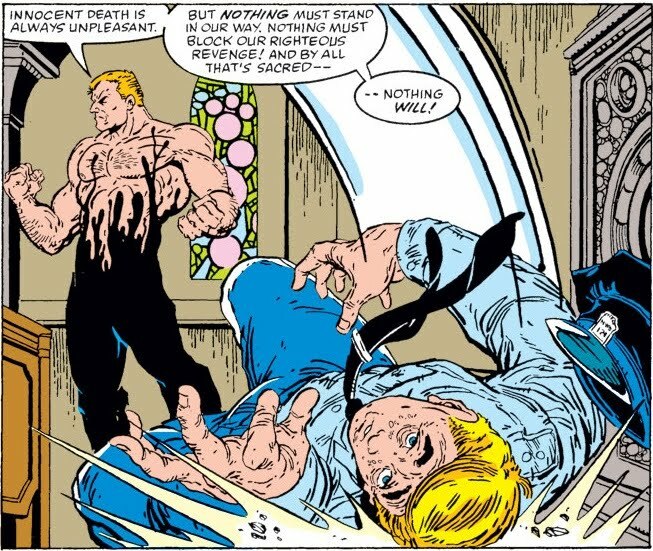 When Spider-Man captured the real Sin Eater, Brock was left to look like a fool for writing false stories. He became the laughing stock of the journalism world and was forced to write the garbage that he was. He blamed Spider-Man for his downfall. Add that to the hatred that the alien symbiote has toward Peter Parker for being rejected, and you have one mean, hateful, superpowered badass. At the end of the issue, Peter Parker decides to go back to his original red and blue tights instead of the black ones. Now that Venom exists, the black costume would be more likely to strike fear into people than a feeling of hope. 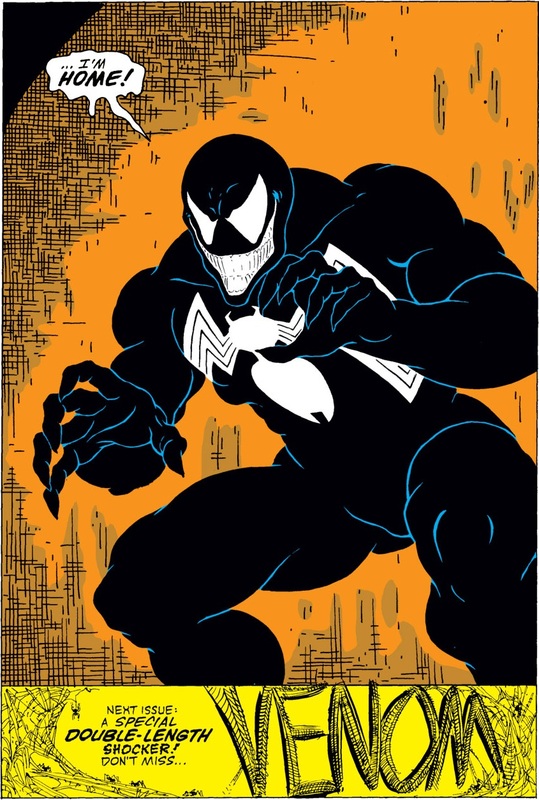 This comic has been on the radar for a long time and Venom is definitely one of the more fan favorites of Spider-Man foes. And even with all of the copies that are out there, this issue still demands a good amount of cash for high grade copies. There are also a couple of reprints and foreign editions out there for you variant hunters. I'm not going to get into the foreign editions, but I will go over a few of the reprints in the order they were released. First, in 1998, Marvel came out with a Chromium Edition of this issue. This reprint has an estimated print run of around 3,300 copies. What would the 90's be if we didn't have a chromium cover of this bad boy. I seems like all of the comics in the 90's were getting the chromium treatment. Even though this is a reprint, the low print run makes this a desirable comic and is quite expensive in high grades. It's not as valuable as the original first print, but it's not too far off. Even though the print run is low, you shouldn't have any trouble finding a copy online. The next copy was the mini version that was released in 2006. This was a Wal-Mart exclusive that was included in the Spider-Man 2 DVD's. The Sam Raimi version, not the Amazing Spider-Man 2 that starred Andrew Garfield. This version if actually far more affordable, but was harder to find copies online than the Chromuim Edition was. I'm not sure if that's because it has a low print run or because people just shoved them into their longboxes, but my bet would be the latter. The third and final reprint that I'm going to talk about was released in 2007. While the first two reprints sported a cover that was similar or even identical to the original, this cover has completely new artwork by Patrick Scherberger. It is known as the Niagara Falls Edition. These copies are listed as "hard to find" on eBay, but I don't know just how hard. There are a few copies listed on there and it looks like a high grade copy might set you back a couple hundred bucks. So, not as expensive as the Chromium Edition, but a bit more than the Wal-Mart Mini copy. If you're a variant hunter and want to add any of these to your collection, you can click on any of these variant pictures and you will be taken to the current eBay listings. Ok, enough about reprints, let's take a look at some census numbers for the first print of ASM #300. Being an 80's comic, you can rest assured that there are plenty of copies, especially one of key issue status. In the CGC census there have been, at the time of this writing 12,800 copies. That's more than the entire print run of some comics. And that's only the copies graded by CGC. There have also been multiple copies graded by both CBCS and PGX. If you're looking for a good investment copy, you should probably only be looking a 9.8 NM/M or 9.9 Mint copies. Right now, there are 850 9.8 NM/M copies, and, believe it or not, 10 copies graded a 9.9 Mint. The market place gets flooded as soon as you move down to the 9.6 NM+. There have been well over 2,400 copies at that grade and there are even more graded at 9.4 NM with over 2,600 copies. With so many copies at this grade, I don't see values rising up for these very fast. Speaking of values, it' that time in the post that I talk about some sales figures. It looks like, for the 9 months or so, that 9.8 NM/M copies have consistently sold for over the $1,000 mark and have started to creep their way up to the $1,100 and $1,200 mark. However, 9.6 NM+ copies are selling for much less. Sales have been hovering around the $400 mark for close to the past year, which is only slightly up from $300 to $350 the year before that. Sales for copies below 9.0 get a little weird. In Jan. of 2016, you could get an 8.5 VF+ copy for slightly more than what some people were buying 4.5 VG+ copies for. They were both selling for slightly less that $150 at that time. That is interesting to me, but also confusing at the same time. If I had the choice to spend $150 on a comic, I would definitely buy the highest grade I could at that price, not settle for a crappy low grade book for the same price, but that's just me. Anyway, this is a popular comic, and does sell quite well, especially in high grades. It's consistently #1 or #2 on the most active list at GoCollect. If Sony does make a Venom, or a Venom vs. Carnage movie in the near future, this comic could see a nice bump in demand, and in value.